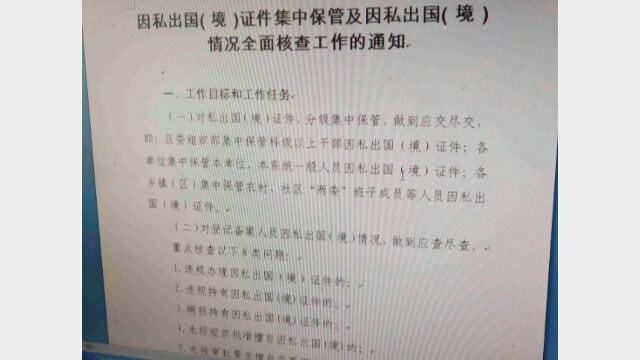 The targets of these restrictions include teachers and health-care workers, in addition to low-level civil servants. 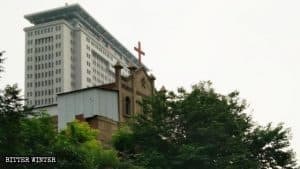 The Chinese Communist Party (CCP) has long restricted traveling abroad for private purposes, but in recent years, the authorities have gradually tightened their outbound management of low-level civil servants and have expanded this regulatory policy to the education field, demanding that primary and secondary schools across China strengthen their control over teachers going abroad by collecting teachers’ passports. This edict was passed down right before last year’s National Day holiday, on October 1. “To all school district directors, secondary school principals, directors of primary and secondary schools directly under county governments, and kindergarten directors: Please gather together all of the passports, Exit-Entry Permits for Traveling to and from Hong Kong and Macau, and Travel Permits for Mainlanders to Enter and Exit Taiwan of all of your work unit’s teachers and submit them to the archive room of the Bureau of Education for unified management. For those who refuse to hand over the documents they hold for leaving the country (territory) for private reasons to the personnel department, they will be punished,” a notice read. 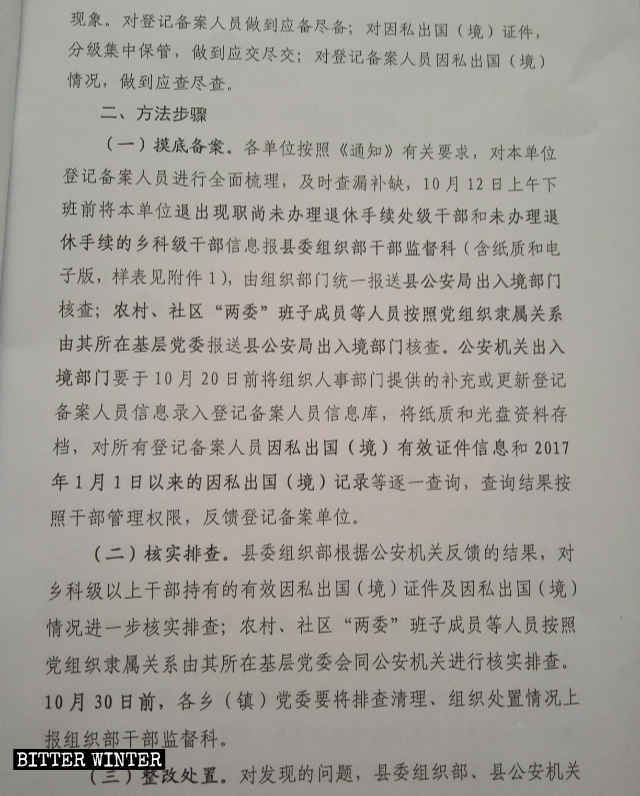 That notice was sent on September 7, 2018, to a primary school’s teachers’ WeChat group in Yinchuan city in the Ningxia Hui Autonomous Region. 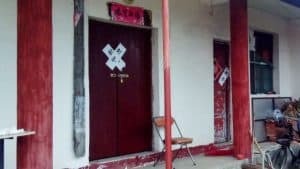 And so, that school’s principal complied with government orders, urging teachers to turn in their passports for private affairs, which teachers were obliged to do, the school’s teacher said. In China, there are varying classes of passports: ordinary, aka a passport for private affairs, which is what most civilians would use to travel if they were allowed, plus diplomatic and service passports. 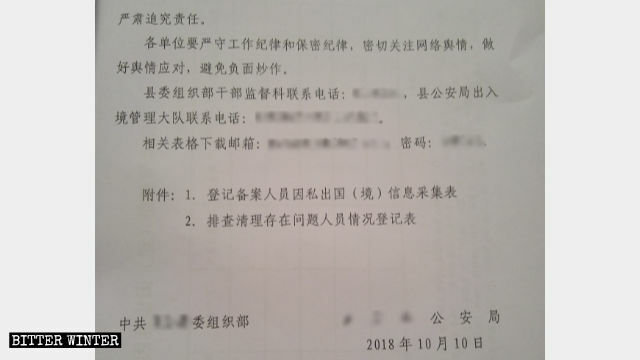 On October 9, another message was sent by the school authorities in that teachers’ WeChat group, which stated that according to the provisions in the newly revised Disciplinary Regulations of the Chinese Communist Party, implemented on October 1, the autonomous region’s Department of Education has currently stopped processing procedures to go abroad for private reasons. In other words: None of the teaching and administrative staff can leave the country at will. Worse, this practice of refusing to let citizens leave the country continues to be implemented throughout China. Imagine basically being a prisoner in your own land. 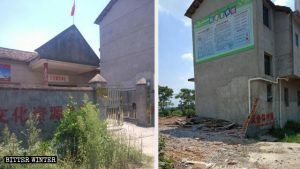 On December 25, 2018, the Education Bureau of Xinle city, in China’s northern Hebei Province, issued a document entitled Urgent Notice on Conducting Special Clean-Up and Regulatory Work for Illegally Leaving the Country (or Territory) for Private Purposes. The notice demands that all schools in the city focus on “cleaning up” and “regulating” cases in which people refuse to hand over their documents for leaving the country for private purposes; leave without approval; don’t report their travels abroad for private purposes, and so on. The notice also demands that all units conduct further verification and investigations of valid documents for going abroad for private purposes held by the unit’s personnel whose passports and other related documents had been registered and filed, to ensure that all necessary documents are handed over. The clamping down on the travel of teachers is the first time in roughly 40 years. Aside from teaching staff, in recent years, the authorities have also been constantly strengthening their control over the departure abroad of low-level civil servants and public personnel. An information collection form for the registration and filing of personnel leaving the country (or territory) for private affairs. 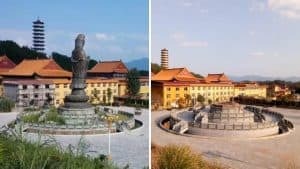 Last October, a county government in Hebei Province’s Baoding city issued a notice demanding that the staff and leaders of all units who are on regular payroll in the county hand over their passports and exit-entry permits for traveling to and from Hong Kong and Macau, as well as travel permits for Taiwan, for unified management by the unit’s specially assigned staff members. 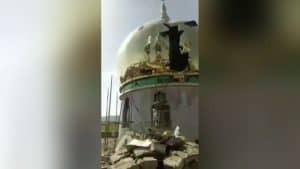 The notice also emphasized that if anyone doesn’t report their travel abroad with a passport for private purposes or refuses to hand over their documents for leaving the country, they will be reprimanded by the unit’s Party committee (or Party branch). Lu Yao (a pseudonym) works at a hospital in Baoding. She told Bitter Winter that the hospital confiscated passports from the staff in November 2018, right after the hospital received the notice to do so. If employees need their passports, they must apply to the hospital’s management and wait for an approval. A county government-issued notice received by the hospital regarding the centralized management of the documents for traveling abroad for private affairs. 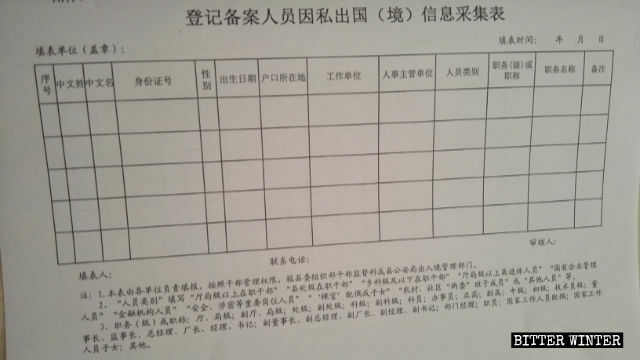 At around the same time, the Public Security Bureau of a county in Hebei’s Langfang city also issued a document demanding that the entire county continue “to carry out the special regulatory work” aimed at those who hold documents for leaving the country for private affairs and implement hierarchical, centralized management of passports. 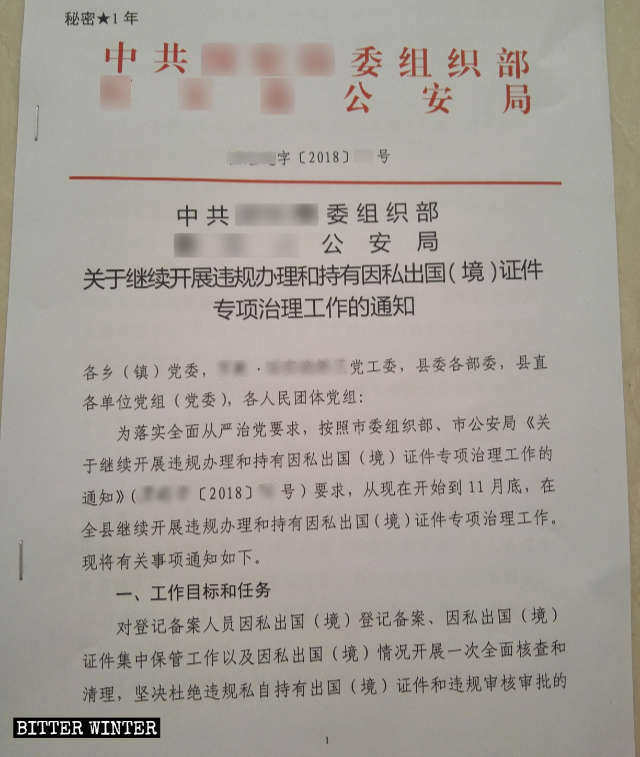 A secret “red-headed” document issued by the Party Committee’s Organization Department and Public Security Bureau of a county in Langfang city, Hebei Province. 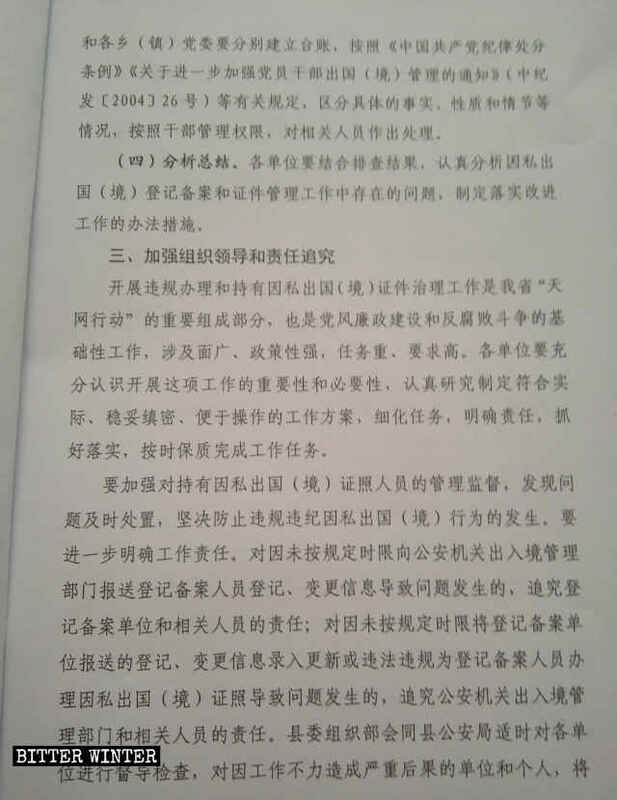 The document also states that this special regulatory work is an essential part of Hebei Province’s “Operation Skynet,” an anti-corruption campaign started by Xi Jinping’s government, which aims to have corrupt officials who have fled the country returned by countries like Britain and the United States.